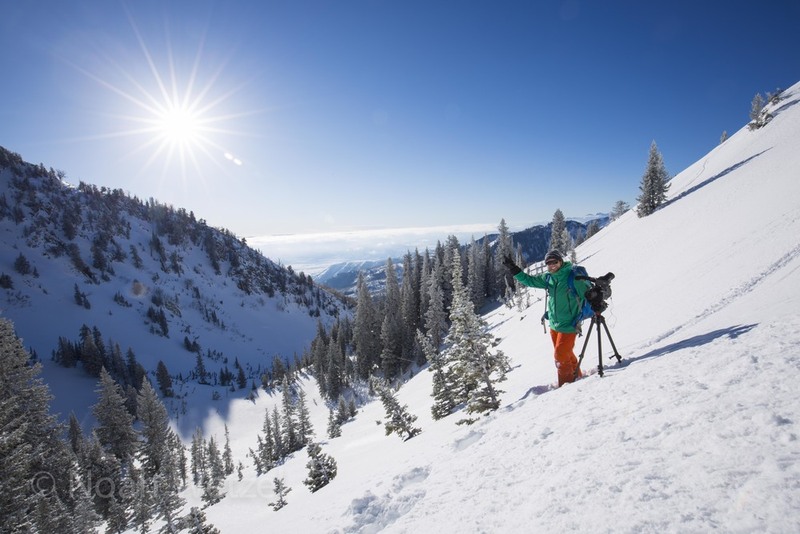 In 2007, Visit Salt Lake created a photography competition to help showcase the world class skiing located within Big & Little Cottonwood Canyons. The contest features eight selected photographers from across the globe and 24 selected local athletes. Each photographer drafts three athletes and then each team is assigned to a specific Cottonwood Canyon resort per day (Alta, Brighton, Solitude, and Snowbird). 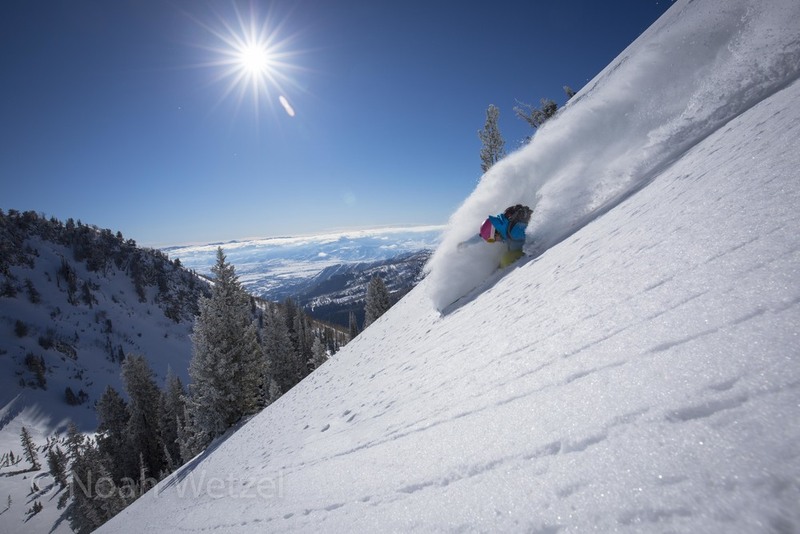 The contest takes place over 4 days, the photographer submitting 2 images (no more…no less) from each resort – totaling 8 portfolio images plus 1 image for the off-the-mountain category (showcasing the convenient aspects of Salt Lake and its relativity to the ski resorts). The past three seasons I have competed as an athlete, however this year I was accepted as a photographer. I pre-selected my good friend Willie Nelson (due to our experience skiing and shooting together since 2010). I then proceeded to select my roommate Chris Brule – Chris is a very strong skier with a consistent fluidity that exemplifies power and also compliments Willie’s style. I then rounded out the team with the wonderful Lucy Sackbauer – I had the opportunity to ski beside her in a short commercial created for Alta Ski Resort earlier this winter…I was simply impressed by her. Lucy is not your typical skier; she’s very smooth, powerful, and most importantly not afraid to send it! I selected my teammates based upon chemistry... all of us know each other; therefore throughout the contest it was never stressful due to our cohesiveness! Anyway, all in all it was a great week! Below I’ve showcased my submitted portfolio with the correlating stories behind the capture of each image. Long days…early mornings and late nights with good people, I couldn’t be more satisfied or stoked with what we accomplished throughout the week despite the lack of snow the previous 3 weeks prior to the contest. Enjoy! 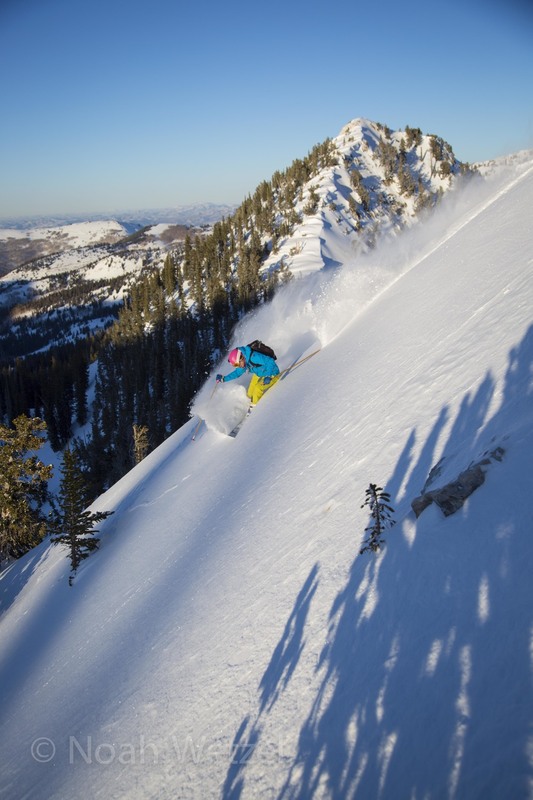 LUCY SACKBAUER skiing at sunrise in the Brighton Resort sidecountry with the stunning Mt. Timpanogos looming in the distance! This contraption took over 10 hours to create...ha and a bit more improvising on the spot to capture this shot of Willie Nelson @ Brighton Resort on day one! Willie Nelson, Lucy Sackbauer, and Chris Brule skiing Suicide Chute underneath a full moon in Little Cottonwood Canyon, Utah. Fast forward a year. Full moon coincides perfectly. However, after waking up at 4am in the morning to shoot Sunrise at Brighton Resort...and sunset, we end up rallying at 11pm ---Willie Nelson, Lucy Sackbauer, and Chris Brule (actually hiking Suicide), while I hiked to a spot 400ft above Hwy 210 to secure a perfect vantage point. Unfortunately on the hike my timer remote cord had been bent/broken and left me with the limitations of a 30 second exposure. It took about an hour to dial in settings, however every second longer the moon rose and grew with illumination...thus improving the scene! Based upon the limitations I was forced to abandon my plan of a powder 8 shot and proceed to position them; (Willie, Lucy, and Chris) in 1/3 's, and 1/3 'd of the way down the chute. Luckily everything somehow came together and they were able to randomly link Powder 8's upon the decent on accident...and managed to fill the image space with their light trail...yet...not leave the frame! 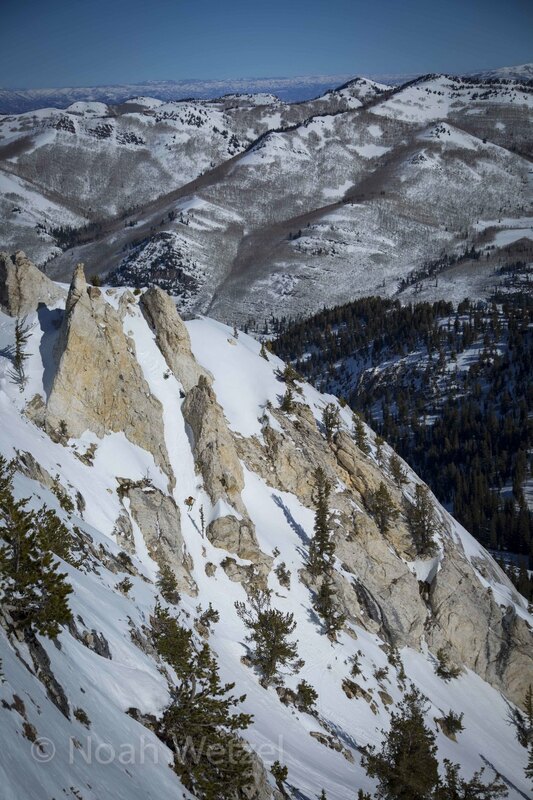 WILLIE NELSON gapping a creek below Snowbird Ski & Summer Resort, Utah! Leading up to the contest Willie (my pre-selected athlete) approached me about shooting a creek gap. For whatever reason... creek gaps have always sparked my interest due to their intricate nature and surreal look! However, creek gaps are very very tough to shoot...because it is tough to find a location that has a steep enough slope (to gain enough speed)...yet a flat spot before the creek for the actual jump, and a proper landing/outrun. Most water you do find in the mountains either has too much snow on top, or there are two steep slopes on either side that create the drainage. One week prior, Willie and myself ventured down to Snowbird to the location to do some recon. Once again, this creek gap certainly wasn't ideal. For one, the in-run was very abrupt and required excavating a 5ft wide/ 5ft deep channel upwards of 30ft in distance to create a proper transition (thousands of pounds of snow). Secondly, the landing was no more wide than your average household stairway...with a few scattered sprucelings and stumps...not to mention the funneling back into the creek on both sides 15ft after the ideal landing spot....Yes...tight it was, and it would require the building of an urban style landing as well. After heading to Montana for my brothers wedding just before the start of the competition, I left Willie with nothing but a large grain shovel. This is one of the many reasons I pre-selected Willie as my main athlete...Willie is one of the hardest working athletes out there and we both knew we would need a list of go-too ideas if the snow conditions were less than ideal. I.E. We needed shots that will look good regardless of the lack of snow the past three weeks! True to his nature and word, Willie labored tirelessly to sculpt and manicure the in-run, take-off, and landing before I returned. Sure enough...upon my return I was amazed at how clean everything looked---and that it was actually doable! After shooting the exposure on Suicide Chute at 1 am (counting for Snowbird), we only had to capture one great shot the remaining 23 hours. Luckily we found success at Snowbird before 9:30am and we still had the creep gap shot remaining...giving all of us time to take a nap (and giving me enough time to cruise to Downtown Salt Lake City to pick up a new Timer-Remote for the following day's shots on a boom at Solitude Mountain Resort). Long story short...or long perhaps, Willie had the jump ready to rock and after positioning 3 strobes, we were ready to rock (one on the far-side of the take-off, one on the near-side of the landing, and one final flash to my right ...lighting up the creek-bed and foreground)! One final thing....Waders, yes...how did I possibly cruise around finding the correct angle along with setting up my flashes on either side of the creek--Waders! Patience and a number of test-runs, and we were able to throw down the hammer on this shot during our 15 minute window of perfect light! Thank you Willie for all your hard work, I would expect nothing less! 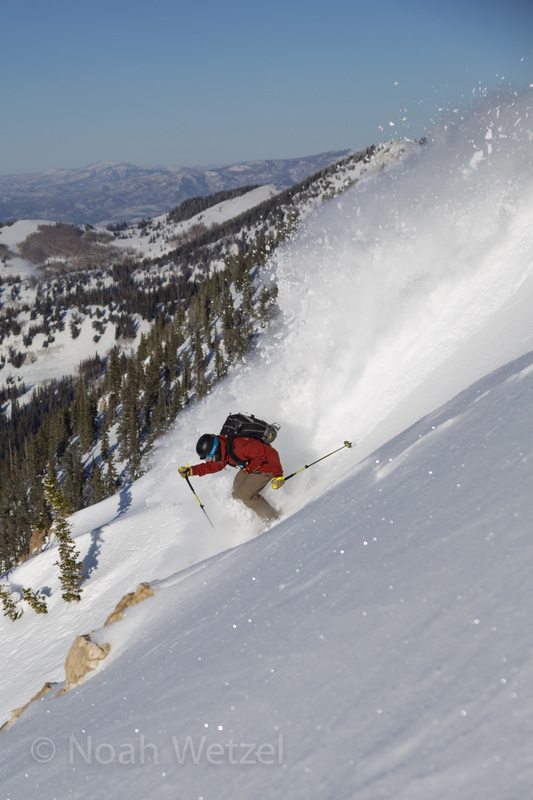 CHRIS BRULE skiing a tight disappearing chute on Fantasy Ridge @ Solitude Mountain Resort, Utah. 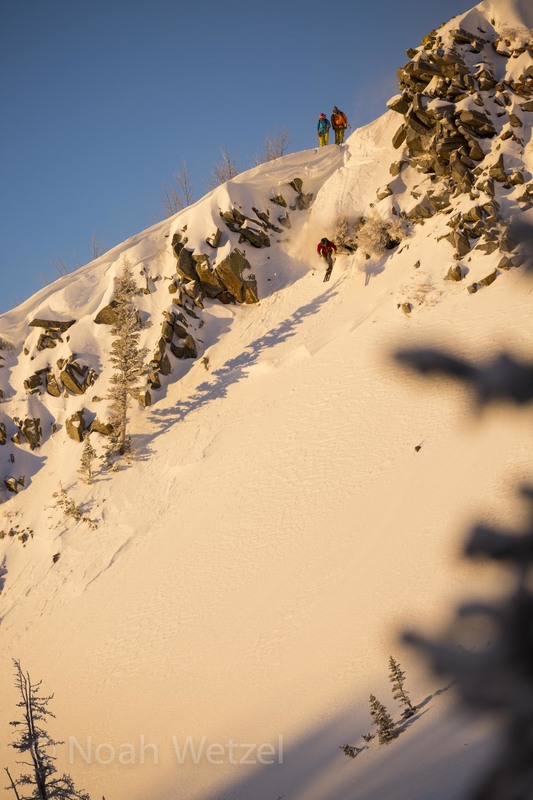 Fantasy Ridge at Solitude Mountain Resort has some of the most badass in-bounds terrain in North America, and just like the name...Solitude exists daily! I had wanted to shoot this on a boom 15ft in the air, but unfortunately (or fortunately) the blind roll over limited the aesthetic qualities of the chute...forcing myself to look for a different angle. It wasn't hard...the contrast between the rocks created the perfect window of composition looking directly at Fantasy Ridge to the East. After balancing on my mid-soles on a small ledge and somehow blocking out the sun with my left hand (diffusing sunspots)...I was able to squint into the viewfinder, stay balanced and capture this photo with the help of a circular polarizing filter. 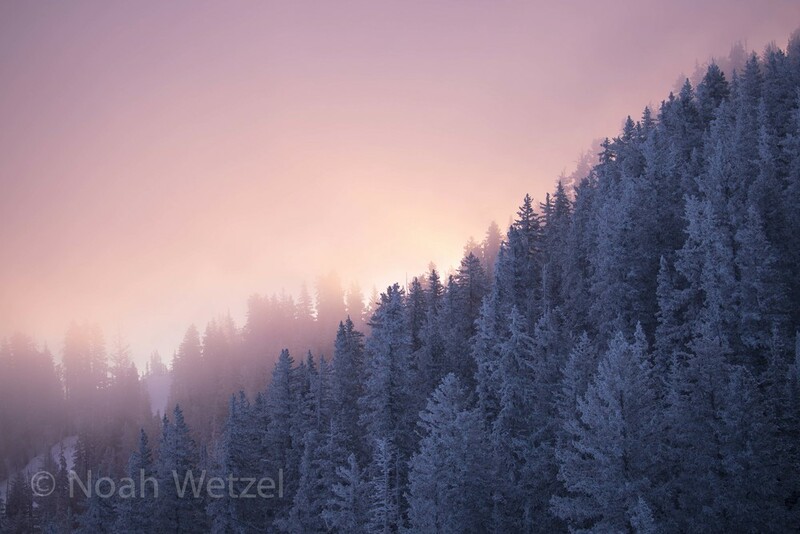 This photo to me epitomizes Solitude Mountain Resort, and I hope all of you will have the wherewithal to visit Solitude the next time you're thinking of skiing in Utah! 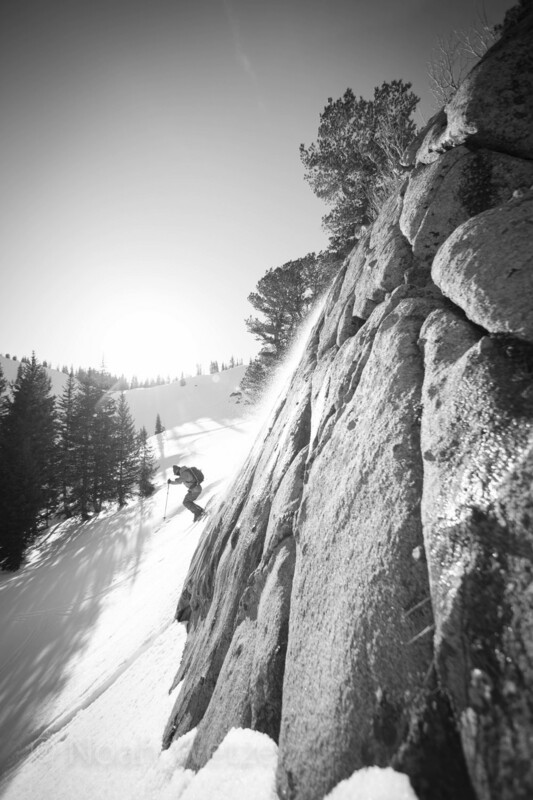 LUCY SACKBAUER ripping down a tight chute on Fantasy Ridge at Solitude Mountain Resort, Utah! This past summer I utilized a 8ft boom to capture some awesome mtn. bike images! Going into this contest I knew that variety would play a huge roll -- giving more feeling to each changing shot and evoking emotion from each viewer. Willie, Lucy, Chris, and myself noticed this chute off Fantasy Ridge at Solitude early in the day...and right away we knew we could create a unique image. On our second lap later in the afternoon we all noticed the chute was still untouched -- typical Solitude. As you can imagine...boom shots are interesting and difficult (unless you have a view screen/button at the base). I gently eased myself to the edge of the chute (positioned near the edge of a very aesthetic spire), and took many a test shot...making sure I had the framing correct and the strength to keep it extended for a long period of time. Chris Brule skied it first with Lucy Sackbauer to follow -- once again the boom shot delivered a unique vantage point -- often canceling out poor lighting or snow conditions! 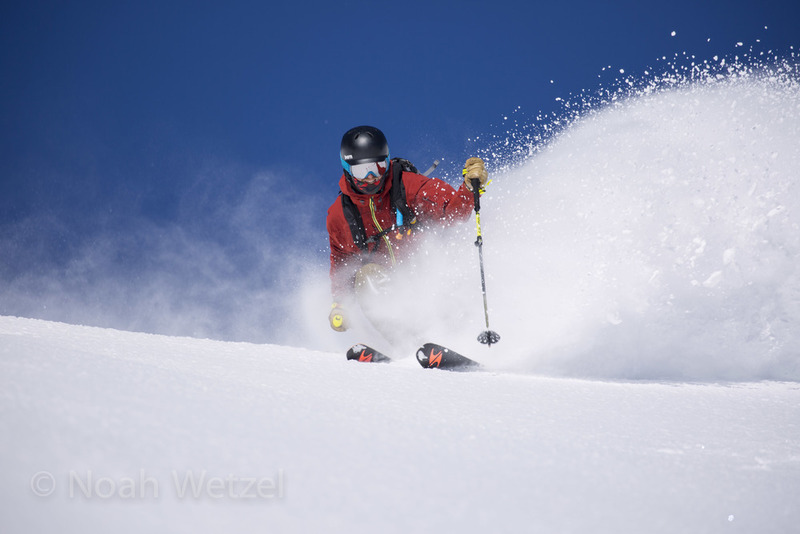 I couldn't be more pleased with this image and also amazed at the in-bounds terrain at Solitude -- untouched at 3:30pm! 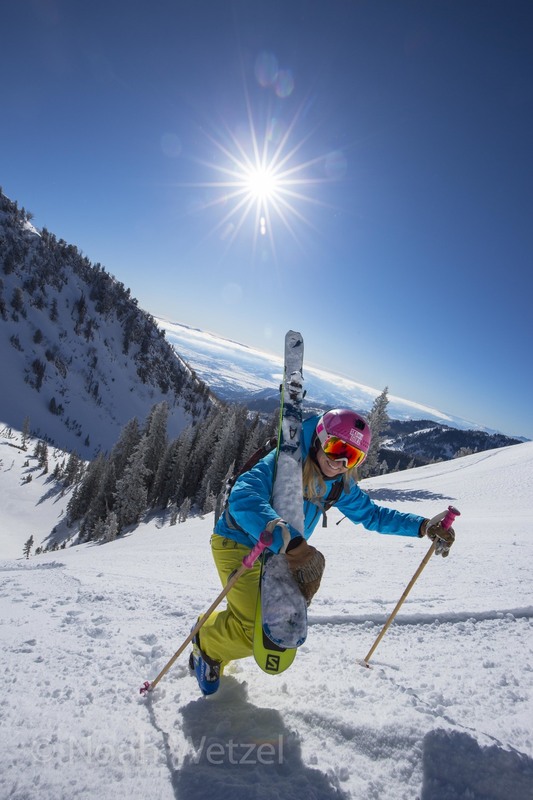 Lucy Sackbauer skiing....shot something...off Fantasy Ridge at Solitude Mountain Resort, Utah! 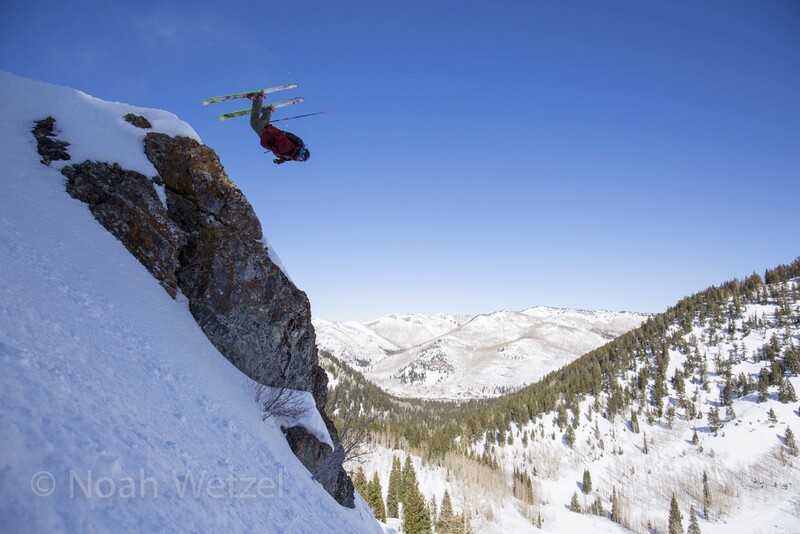 CHRIS BRULE airing it out off a massive cliff at Alta Ski Resort! I can tell you one thing...my good friend Chris Brule can ski like a champ, and he is certainly one of the most fluid and aggressive skiers in Alta, Utah. Don't believe me?...well, who cares its just skiing. But yes - its true. For those of you that don't know ski photography -- it's certainly an interesting game. 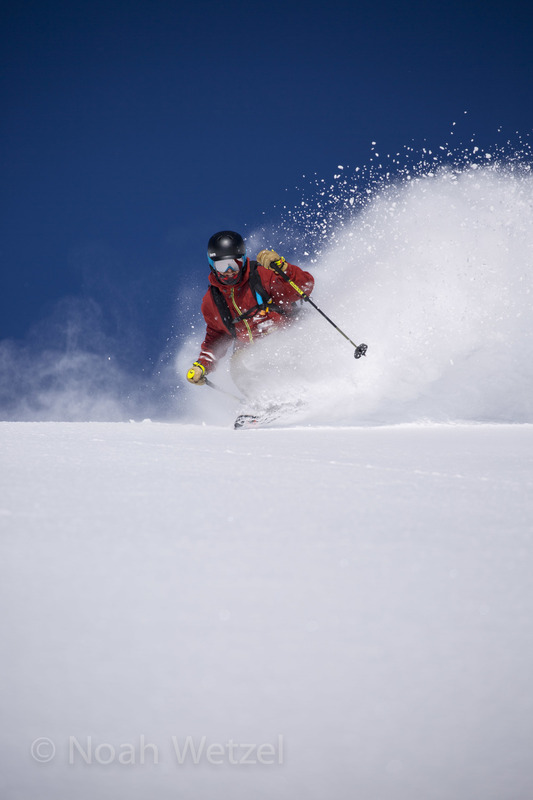 There are so many factors that go into the creation of a great ski image. Both the athlete and photographer have to be on the same page...timing/angle/trick...and most importantly patience! I will tell you one thing...this cliff was absolutely massive for the conditions (snowed a few inches in 3 weeks of high pressure). Coming from the "athlete" side of things, I know how these decisions are formulated. 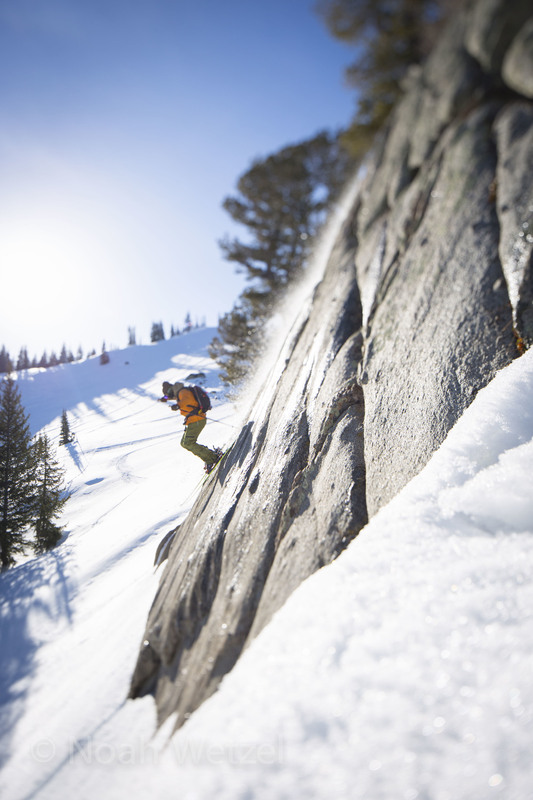 It may only take one individual to point out the cliff or feature...but after much dialog between the skier and photographer...usually it comes down to one thing; if the angle and shot are unique and dramatic, the athlete is much more likely to fully commit to the feature. I have been there many times, and there is nothing worse than standing on top of a feature in which you are skeptical of -- knowing it may lead to a bloody lip or black eye and knowing you probably won't get the shot! The most reassuring words you can hear are; "This shot looks sick man, its up to you...but if you are confident we will get a siiick shot!" This was certainly one of those instances and features! Chris, you're the man! P.S. Alta is the best...great people and great vibes! 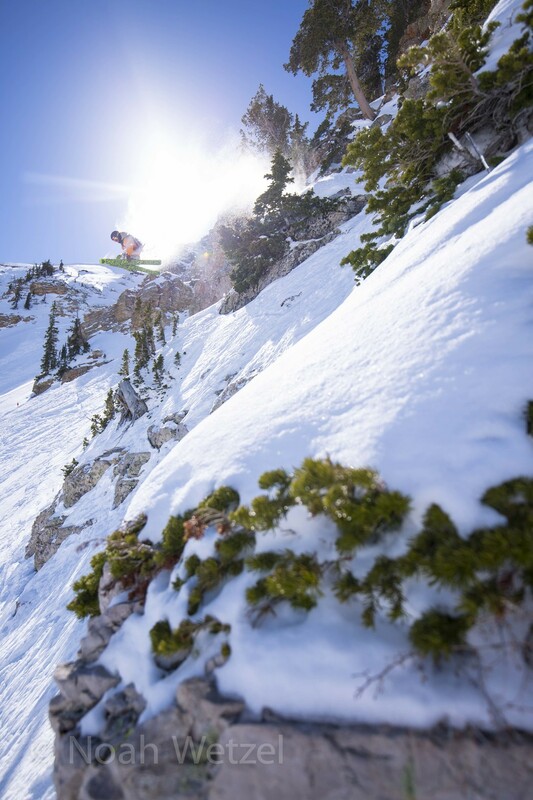 WILLIE NELSON airing it out with a leading 360 Tail Grab in the Alta Ski Resort side country! This was our last shot of the contest... at 6:30 pm the final day. We captured some great images throughout the day, but I knew, we both knew -- that this shot would be the one . One last rally for the gipper! I have hit this cliff before...2008 maybe -- but certainly a straight air. The in-run lines up between trees (at an angle none-the-less) with a tight down sloping take-off. Per usual Willie spent the time to perfectly manicure the in run and lip of the jump; managing to style a leading tail 360 into a firm pocket of snow and ski out clean! Off The Mountain Category. Willie Nelson, Lucy Sackbauer, and Chris Brule enjoying Apres Ski/Bike above the capital in Salt Lake City, Utah! One of the best things about skiing the Wasatch Mountains is the relativity to downtown Salt Lake! From great music, an international airport, nearby desert escape, along with almost year round mtn biking and golfing... the versatility cannot be argued! 5 more minutes would have been perfect on this shot (I am the one to blame for the cheesyness)...but hanging out all week with this candid crew couldn't have been more enjoyable! Thank you Willie, Chris, and Lucy!